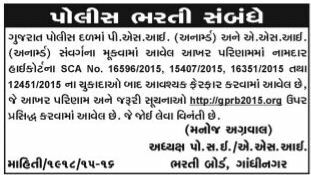 Gujarat Police Board PSI and ASI Bharti Na Mukvama Aavel Aakhar Result Ma Namdar Highcourt Na SCA No. 16596/2015, 15407/2015, 16351/2015 and 12451/2015 Na Chukada Bad Jaruri Ferfar Karvama Aavel Chhe Je Final Result and Jaruri Suchnao gprb2015.org Par Mukvama Aavel Chhe. Je Joi Leva Vinanti.